Are these Murano by any chance please? 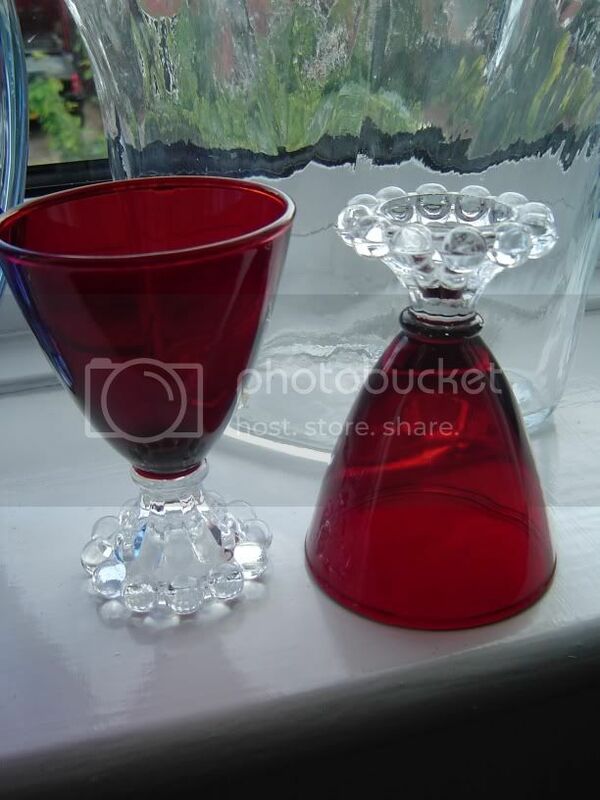 Set of ruby glasses with clear decorative base. Tall cobalt blue bud vase - white showing through on upper neck. Has marks on the base where held by glassmaker's tool I think. Tall bud vase and drinking glasses. Many thanks Anne I checked the link you gave, and mine are the 3.75" version ..... 'Boopie Red Pattern'. Don't you just love that name! I have a complete set of six - all immaculate. The link is to a Replacement Company, so they could well be quite old??? Have you any idea how long your Mum has had hers? I think they have a 60s retro feel to them, but only guessing. Of course they could have been made for years until quite recently. Perhaps some of our American members might know? The tall blue one - very Carlo Moretti looking - but not certain. Hi Anne, Boopie is the name for the foot style not the goblet shape. They made the same shape glass with at least two different style feet - each with a different name, to complicate things! Now Terry mentions it, Berwick is right - I remember looking it up ages ago and had forgotten the name. I don't know how old Mum's are, but I do know she has had them since I was a small child - for as long as I can remember in fact so at least 45 years. I have no idea where she found them - we lived in Radcliffe at the time I was born so no obvious American links! She also had an Anchor Hocking Royal Ruby vase like the middle one in this group: http://yobunny.org.uk/gallery1/displayimage.php?pos=-147 so maybe they all came from the same place/person. Page created in 0.557 seconds with 29 queries.